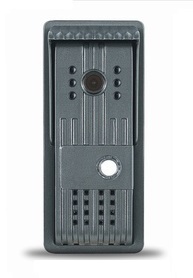 Our BE-701 Door Intercom Station allows controlled entry access to its users. The BE-701 is well contained in an alloy material outer shell and is vandal proof to avoid tampering. Weighing less than one pound, the 3.1 inch wide by 7.1 inch tall BE-701 Door Intercom Station can be surface or angle mounted for easy access. The BE-701 requires a four conductor cable connection for full functionality. The Door Intercom Station allows entry door release features. Apartments, condominiums, business offices, parking garages, schools & colleges, and assisted living facilities are only a few venues that benefit from our BE-701 Door Intercom Station. Contact us for more information regarding the BE-701. This product was added to our catalog on Monday 19 June, 2017. Copyright © 2004-2019 BEC Integrated Solutions, LLC. All Rights Reserved Worldwide. Home Audio Plus your Electronic Communications Specialists. Designated trademarks and brands are the property of their respective owners. We are not responsible for typographical or photographical errors. Prices and specifications are subject to change without notice. Use of this Web site constitutes acceptance of our Conditions of Use and Privacy Notice. Any unauthorized use is a violation of applicable laws. Main No. (716)-689-0871, Fax No. (716)-689-0872, Toll free No. (888) 556-3998.